Welcome at the homepage of XR3J, a special radio amateur station which is situtated at the World Scout Jamboree 1999 camp site in Chile. The Jamboree amateur radio station will identify with the call sign XR3J. 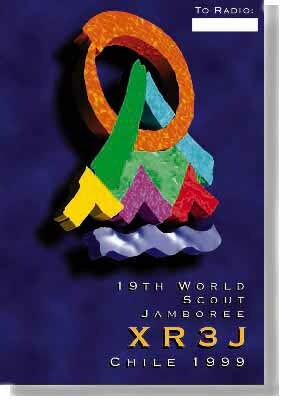 the XR prefix is used in Chile for special events, figure 3 shows the area 3 in Chile and the J stands for Jamboree. On these pages you can find more (technical) details about this radio station. If you're a radio amateur, try to make radio contact to this special event station and you'll receive this special QSL-card (shown left). We are 'radio active' from 26 Dec 1998 - 6 Jan 1999. PA3BAR Richard, PA3GVR Sjaak, PY2RAR Ronan, K2BS Shelly, LW4DYZ Victor, LX2AJ Philippe, HB9AOF Yves, PA3EFR Erwin, PY5DZ Fernando, ZL2APE Jim, LW1ECO Dario, LX3DL David, MØAEU Frank, PD1AIL Jos, OH2BXB Banda, OZ1JRD Lisbeth, LU2CSN Carlos and G7VFD Peter. Picarquín, Chile, 60 km South of Santiago. Pages will be updated as soon as our internet connection is working properly, we still have som technical problems over here.